Vancity, Arrival Agency, and Streetfood Vancouver present Food Cart Fest at New City Hall Plaza in Surrey. Launching on Saturday, July 5, the festival will run for 9 weeks till August 30. After a successful launch in Vancouver on Sunday, which drew record crowds, the city’s biggest summer food event is pleased to announce it’s coming to Surrey! Since its inception in 2012, Food Cart Fest has quickly become a must-attend event in Vancouver. Last year, upwards of 5,000 people swarmed to Olympic Village every week to take in the city’s exploding street food scene, and the event was given honours for Best Food Event in the Georgia Straight’s Golden Plate Awards. Like its Vancouver counterpart, Food Cart Fest in Surrey is free to Vancity members or with a non-perishable food donation to the Greater Vancouver Food Bank Society. “For the past two years Food Cart Fest has been a great way to bring the community together to celebrate the Lower Mainland’s exploding street food scene. We’re thrilled to be able to expand the festival into the heart of Surrey, at a landmark-setting like New City Hall,” says Ernesto Gomez, Arrival Agency. Showcasing the Lower Mainland’s street food scene, there will be more than 15 trucks every week, many of whom will be launching their new summer menus. The Surrey Carts will include select vendors from Surrey’s recently approved list of mobile food vendors. 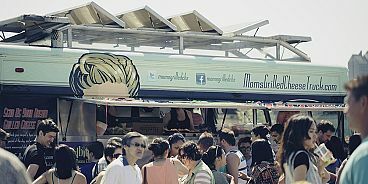 “Surrey is launching its Mobile Food Vending program in 2014 with food cart and food truck vendors operating out of 5 locations in the City combined with Food Cart Festival weekends happening at the City Hall plaza throughout the summer months. These food truck locations will be a catalyst for bringing great food and urban vibrancy together throughout Surrey. It is hoped that the 2014 pilot program will also lead to bigger and better food vending opportunities in the future,” says Richard Ryan, Manager of Business Operations & Support Services at the City of Surrey. Participating Vancouver trucks include: Didi’s Greek, DougieDog, Holy Perogy, Le Tigre, Mogu, Pig on the Street, Re-Up BBQ, Reef Runner, Roaming Dragon, Soho Road, Varinicey Pakoras, Vij’s Railway Express, Yolk’s Breakfast, and Ze Bite. “All of the participating Vancouver trucks at Food Cart Fest are members of Streetfood Vancouver, a non-profit association. We represent the best and most unique Food Trucks in Vancouver and can’t wait to bring them to Surrey. We’re excited to have the entire summer to showcase what we do alongside Surrey’s top trucks and give people a taste of the best the lower mainland has to offer,” says Andy Fielding, president of Streetfood Vancouver. Not exclusively for foodies though, Food Cart Fest is also about enjoying the summer with friends and family. Complementing the rotating cast of trucks will be community markets, DJs, artisanal food vendors, and kids’ activities. In addition to being the Lower Mainland’s tastiest food event, Food Cart Fest is striving to be its greenest as well as it has a zero waste mandate. Achieved via support from title sponsor Vancity and their community partners Recycling Alternatives and Green Chair, the event will be as green as possible this year. Starting July 5, come experience what makes summers in Vancouver great: food, fun, and sun — every Saturday until fall! Free with a non-perishable donation to the Greater Vancouver Food Bank Society.